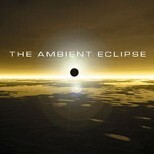 — Ambient Eclipse introduces many well known, established ambient composers in this progressive, experimental community. Like a collective of artisans gathered together to create a gallery for a dignitary, the composers on this release have included some very special and intelligent sound explorations. Artists like Steve Roach, David Knight, Peter Ball, Paul Tedischini, Frank Quasar, Stephen Bacchus, R.S Thompson, Hiroki Okano, Jeff Pearce, Mycheal Danna and Tim Clement are the esteemed some captains who gracefully explore the terrestrial and cosmic relationship of nature and technology. There are so many scientifically designed arrangements and visions on The Ambient Ecipse that showcases ingenious methods of divine sound manipulation. — Its one of the finest collections ever assembled. — Following his return from the Mayan ruins in Mexico, Stephen Bacchus completed his latest album, Ancient Mysteries. "Walking through the ancient ball court of Chichen Itza inspired 'Challenge at the Ball Court.' It was easy to imagine the intensity of a game in which the losing captain would be decapitated," Bacchus recalls. This intensity is evident throughout Ancient Mysteries even when the mood is reflective, as in "By a Watergarden." multimedia performances and studied saxophone, bass clarinet, and Indian drumming. His debut album, Pangaea (1991), won critical acclaim in Europe, Asia, Australia, and North America. Ancient Mysteries is inspired by enigmatic ancient civilizations. He illuminates the cultures of the Celts, Mayans, lncans, and Sri Lankans, as well as the lost continents of Atlantis and Lemuria. "What I have learned in researching this project," he says, "has deepened my sensitivity to and understanding of not only the past, but also the present. These ancient civilizations and their ideas are powerful realities that exert a subtle yet profound influence on the world around us." Bacchus creates an exotic musical texture by combining synthesizers with acoustic instruments such as the Mayan clay recorder, Oriental flutes, percussion, lute, and voice. —The music of Calverley Is filled with Celtic influences and mystique, as it evokes the mood of ancient times in the land of Avalon, and the legends of King Arthur. Mid-tempo and slower pieces combine the sounds of harp. recorder. flutes. pipes. harpsichord. strings and frame drums. Even bagpipes are heard on 'Piper's Fancy,' and just the right touch of medieval flavor round out this impressionistic picture of bygone days. Llght~hearted. the spirit of stately court music comes to life in the medium of modern technology and instrumentation. 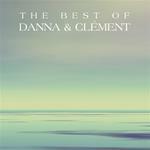 — This 20 BIT, meticulously remastered release is a compilation of the best ambient tracks from Danna and Clément's albums, A GRADUAL AWAKENING, SUMMERLAND and ANOTHER SUN. It consists of seven tracks that use "classic" analogue and digitial synthesizers, samples, bowed guitar, autoharp, nature sounds and tape loops to create spiritual music that speaks of the bond between the world of nature and the world of the soul. Also features a "Limited Edition" full-color, eight-page booklet detailing the history of the duo's writing partnership as well as extensive notes on each track. Mychael Danna's soundtrack credits include Exotica, The Ice Storm and The Sweet Hereafter. — Celtic Spirit is truly a magical album. Mary Anderson and Joanne Meis are obviously two very accomplished harpists that are expert at playing together and complimenting each other. The choice of tunes is perfect for the Celtic Harps, showing the range of both the instruments and the performers. It's delightful to have the focus totally on the two harps, with no other background instruments. The pure sound of the harps comes through, from the bass notes you can feel to the clean clear high notes, supported by a flawless technical and recording quality. If this were a book, it would be one that you couldn't put down. — This unusual recording captures the special grace and magic of the Celtic Harp. The material ranges from such popular tunes as Scarborough Fair to some more obscure but equally beautiful traditional pieces. Listeners just discovering the delightful sound of the harp will enjoy hearing the more familiar melodies. And while some folk enthusiasts may cringe at the thought of yet another version of Barbara A!len, the arrangement crafted by these two talented harpers, and the inclusion of excellent versions of several less well-known tunes (Gus Breo is worth special note) make this album a must for anyone with a taste for the harp. 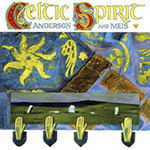 While Celtic Spirit gives the listener none of the fire that the instrument is capable of, it is a wonderful exploration of the gentler spirit of: the queen of instruments - the Celtic Harp. Review by Terry Wedge Beyond Music Inc.
— These lovely melodies with their ancient spiritual roots are beautifully played on Celtic Spirit by two fine harpists. The arrangements are clean and clear, making effective use of both instruments. The melodies selected are familiar and accessible, and the music is soothing and deep. You should find this album useful either for a concentrated attunement or for pleasant background music. — In these duets on Celtic harps, two women spread a magical quilt of sensitive and powerful beauty. Down By The Sally Gardens, a sweet ballad suggests meandering among the softly draping spring-green willow gardens grown for thatching near the river. Rolicking South Wind mythologizes a man becoming the wind to warm and hasten the crops. Feather delicate plucked passages relate the tragedy of Barbara Allen and William whose love transcends the grave in the form of interwoven rose and briar vines. Celtic Spirit, popular and familiar, mourns unrequited love. The Ash Grove resonates with spicey, sweet memories of past love lost to death. The only unfamiliar tune to me, Gus Brio, noted as an Irish "slow air' is a longingly sweet and melodious change of pace. Garten Mother's Lullaby, an ancient tune with strummed repeat phrasings, soft and low, completes this playfuy soothing, always superlative collection of harp sounds from Scotland, Ireland, England. The obvious earthy sound of these traditional harps played in duet is wonderfully rich and gives greater depth and dimension without losing any of the delicacy. A must for harp and Celtic enthusiasts. Excellent for quiet listening, driving, healing. 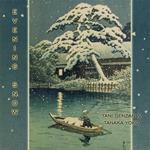 — Zen Spirit and Evening Snow, released by Oasis Productions, are so powerful they force a re-evaluation of what New Age music could be. Jacques Chailley, professor of music history at the Sorbonne, believed the 20th century "has forgotten what music is, what its purpose is, and for whose ears it is intended". In ancient cultures, music was not an art but a force with magical power - "After the gods have spoken to men through music, men through music will speak to the gods." Instead, most recent composers seem more interested in concepts, and popular music aims at personal emotions and getting the body moving in dance. Much New Age music aims at relaxing people overstressed by life. But we would not over-stress ourselves if relaxation were enough. Chailley found religious music originally aimed to put the listener into ecstasy. The best New Age music aims for ecstasy, and surviving traditional music with the same aim fits well into the New Age scene. In the Japanese Zen tradition of the shakuhachi flute there is a saying: "chi on je Butsu" - "In one single sound there is the quality of Buddha-nature". This impact is achieved through awareness of the quality of sound, the improvisational subtleties within the compositions. The teacher must initiate the shakuhachi student into this spirit of die music - of Zen - of Japan. If the student can grasp it, the music may transform the listener. 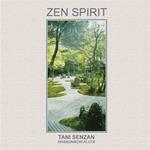 Tani Senzan has definitely grasped the spirit of the shakuhachi. His playing has the potential to awaken subtle levels of our being. Both albums have a deep connection to nature, evidenced by the feeling as well as the titles of the pieces. Those who are following a spiritual path or attuning to power animals or nature spirits may find themselves drifting away on the music. Other New Agers should find it as refreshing as a short walk in the snowy woods. — I have a walkman-type CD player with earphones, so that when I played your music, it was right in my head. Deep in my head. It was an astonishing experience. I shut my eyes and let it happen, and it was though I could see the sound. Truly. In fact, when I rememeber "Mystic Sojourn", I both see and hear it. I think your kind of music/sound is the best thing I've yet hit for encouraging meditation. My brain is always too busy, busy, busy, to make emptying it easy. Easy! It's next to impossible. But plug myself into your music and the sound sort of occupies my mind. Or fills it. There's no space left for the trivial or troubling thoughts that are usually lurching around in my head. Thank you for that. Congratulations on your achievement! 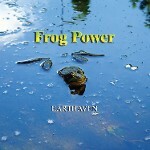 — What makes this CD so appealing to frog fanciers and naturalists in general, are the calls that are not mentioned on the CD jacket, which only trained ears can pick up. It seems that every time I play this CD, I hear something additional that has emerged vocally to add atmosphere to the CD. So, it isn’t just the stars on stage that give this CD its appeal, but rather, the subtle sounds of the other background actors and extras that mold a complete framework....An amazing accomplishment, to capture all these background sounds of nature while not losing focus on the stars of the show. Producer Grant Mackay has outdone himself admirably with this recording. — Songbirds pleasantly chirping in the cold of winter. Wildlife from the Canadian wilderness in the heart of Los Angeles. Only through the magic of natural ambience recordings can these instances be possible. Grant Mackay has an ear for the sounds of nature. For over a decade he spent considerable time trekking through the wild regions of Canada to locate pristine environments for his "Earthaven" series of nature recordings. "It is not only a question of finding the right spot but making sure your are there at the right time of year and the right time of day," he explains. "Weather and annual seasonal patterns are a big factor. If it is a particularly wet spring then the opportunities to record become limited both in terms of access to wilderness and because you need perfectly still, calm, sunny days to get the best recordings." Mackay got the bug to start recording nature sounds in 1998, after a trip into the James Bay wilderness in northern Quebec. The plan was to move deeper into the wild with each recording -- partially for thematic reasons and partially due to the difficulty of finding undisturbed land away from civilization. "Although provincal and national parks offer vast areas of solitude, they can sometimes be well-trodden in the summer months. The Earthaven label has made it part of its mission to venture into completely unexplored wilderness areas. Canada is known by hunters and fisherman both in Canada and in the U.S. to have some of the largest tracts of "crown" land. Some of these wilderness areas strectch for hundreds of miles at a time. Earthaven has made use of thes crown lands as well as special protected wilderness zonesthat have been designated as scientifically or environmentally significant. We tread very lightly by canoe or foot (only) into these areas, avoiding the use of motorized land or water transportation. Mackay hasn't always had to travel far to find natural beauty. 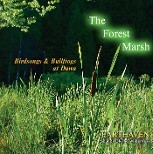 His recording, THE FOREST MARSH came about when he accidentally came upon an oasis of secluded marshland while exploring near his rual home. The artist explains that he was following some of the rough roads used by local farmers for transporting crops. A detour found him in a deep, hidden valley with a serene marsh that he later recorded. 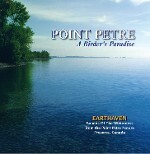 His new album, POINT PETRE: A BIRDER'S PARADISE highlights the symphony of song provided by the area's avian population. CRISTAL SILENCE - Robert Haig Coxon Jr.
— Reviewing New Age music is unlike reviewing any other music. Although some New Age music can be listened to in a traditional manner, much of it demands that the listener perceive its content and function in an entirely non-traditional way. New Age music can be actively listened to for pleasure, or it can be used as an aid for spiritual and healing practices, or, simply as gentle background ambience to relaxation and study. CRISTAL SILENCE is ideal for this last purpose. Robert Haig Coxon Jr.'s music with its string-like textures and suit electric piano sounds provides an undemanding listening space for which relaxation can take place. The simple melodic line which opens the album is repeated throughout using changes in texture, length of melody, and timbre to create subtle variations in content. In fact much of this album's appeal lies in its inherent simplicity, without which, the effect of relaxing the listener would not be easily accomplished. Imposing traditional ways of listening is at the heart of the dismissal of New Age music as a legitimate form by some of the population. This is a shame because the public may pass over an album such as CRISTAL SILENCE . cries. They tend to awaken almost ancient primordial feelings, yet the state-of-the-art synthesizers timbres ground us firmly in the present future. My main criticism with this album is its brevity, just over thirty-seven minutes in length. — Ian Tamblyn's "Over My Head" stands alone amongst the ever-growing number of New Age recordings available to the public. As an independent recording it even surpasses many major label releases for clearness and clarity of fidelity. It is simply the best recorded independent release I have ever come across. Originally commissioned by the Museum of Natural Sciences, Ian has set his music apart by his skillful, and at times brilliant integration of bird songs and calls into the eight compositions on "Over My Head". Although many New Age composers have used bird sounds in their recordings, none have succeeded with such adeptness as Ian Tamblyn has, in utilizing bird sounds as distinct compositional elements. One gets the impression that the variety of birds and ducks were hired for the recording sessions, because they perform their cues with such accuracy and sensitivity. and synthesizer. This richly melodic music is full of life and a feeling of attunement with nature, much like the composer himself. 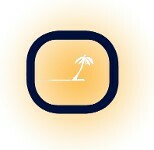 — Darkest Africa meets state-of-the-art technology. RESONANCE is a culmination of previous efforts by Canadian composer and musician, Micheal Uyttebroek. Various drums and percussion instruments of West Africa forge a powerful and synergistic relationship with the naturalistic and space age timbres of sampler technology. Micheal's adventurous explorations into fusing the music of the dark continent with the New Age works extremely well throughout the entire tape. "Thank You", the opening .cut, is the most provocative, conjuring images of some space-age tribe performing a sacred ritual or dance. The drumming on this tape is even more solid than on his previous album, SPIRIT DRUMS, and hearing the melodic aspect of his composing gives the listener insight into another dimension of his personality. The artist should be applauded for his originality and for maintaining a high level of non commercialism, which has become less prevalent with New Age releases. Bravo Michael! It's a winner. — On rare occasions one discovers an album, that, by its sheer depth of expression and subtle balancing of ideas redefines the standard by which all others will be measured. Summerland is just such an album. Stars & Spells which opens the album foreshadows the mood of the entire release. Timbres which resemble a shakuhachi flute and a cello are produced on a digital-sampling synthesizer transporting the listener to a "land of endless summer. "Under August Sun" follows, featuring the Appalachian Harp and the guitar. It functions more as an interlude due to its brevity and light character. Our arrival in "Summerland" is signaled by "Hours In The Garden" An enchanting piece of music filled with the swells of gentle synthesizers and soft birdsongs. It is tranquil and sublime. Magical is the word that best describes the magnum opus onside two To The Land Beneath The Waves. A work of breathtaking beauty, it is a masterpiece of New Age music. Using the sounds of waves, children's voices, cathedral bells, seagulls and synthesizers, the composers create an environment of sonic wonder |Susmszlsnd is a must for anyone interested in New Age music. Most of the tracks on Summerland have been reissued either for download through Apple iTunes on the album The Best Of Danna and Clement or the deluxe edition CD is exclusively available from the Oasis online store The Best Of Danna & Clement CD. Gentle chimes, synthesizer and sounds of the environment mix with solo guitar to create an atmosphere of total relaxation. A mood of tranquility is easily achieved by the music's charm and simple melodic lines. An inspiring guided meditation and music on the seven rays emanating from the seven chakras. A collection of nine original pieces for solo piano. BENEFICIAL DREAMS is a quality digital recording of slow and medium tempo pieces. It holds plenty of melodic and compositional content behind an undemanding surface. Haunting vocals - famous for being used on the TV show "Twin Peaks". Sol is a musician working with the healing arts for many years. He has combined his knowledge of healing with the gift of music to produce MANA. This album is a beautiful fusion of Sol's mellow acoustic guitar and Johnny Pepper's melodic keyboards. Its gentle healing vibrations makes MANA ideal for massage, relaxation and easy listening. Flute, saxophone, harp and sounds of the ocean.